Dave and I love to rock climb. For a couple of years in our life, we climbed regularly all around the Toronto area. We were regulars at Joe Rockheads climbing gym in the city and we hung out with our climbing friends to tackle the local crag on the weekends. That is why when we heard that there was bouldering in Hampi India, we just had to check it out for ourselves. Rock Climbing in Hampi, Who Knew? I can understand why there is so much climbing here. Giant boulders dot the landscape making for perfect bouldering conditions. There are a few bolted routes here as well, but what people come to Hampi for is the bouldering. People come here strictly to climb atop big rocks, and climb they do. If you stay there, you will receive free crash mats, shoes and chalk for your entire duration. Most people bring there own gear here as it is a destination for some serious bouldering. What is Bouldering you ask? It is a lot like climbing, but you do it without a rope. You don't climb as high, but it can be just as challenging, if not more than climbing. People search for routes and problems and tackle them the same way as they would a climbing route. You either are trying to get to the top of the rock, or to traverse across. We had bouldered a few times. At the Niagara Glen near Niagara Falls in Canada, there are some great boulders. Joe Rockheads has bouldering problems in the gym and we would try to tackle them once in a while, but we always liked to stick to climbing. Leave the bouldering to the young skinny guys that can pump themselves up to a hold in a quick dynamic move while holding on with two fingers. 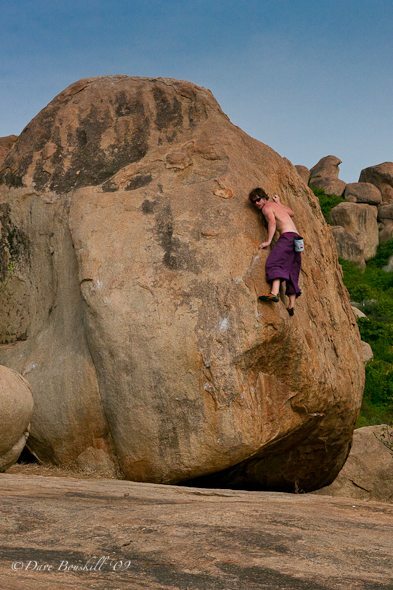 We were never very good at bouldering and here in Hampi, things haven't changed. We rented our shoes, mat and chalk and set out along the trail in search of some easy problem. Right away we found a pretty good set of boulders and proceeded to try to tackle them. We set up our mats and spotted each other as we made our way across by following the chalk marks from other climbers. We did alright. My biggest problem was trying to figure out how to get down when I got to the top of a rock. It didn't seem that high when climbing, but once perched above, it seemed a lot higher. Dave of course had no fear. Then when we watch it back on video, we get mad at each other and say “why did you tell me that looked good?” “It looked like crap!” It is a habit that neither of us has been able to break for 18 years. And as usual, when we got back to the guest house and looked at our photos and video, we both thought that we both looked like crap. But we had a fun day anyway. We spent a few hours in the baking heat during the hottest part of the day. We finished up just as all of the pros came out and were quite happy to be done. They put us to shame as they scrambled up these giant boulders with ease and then hopped from rock to rock to figure out a safe way back down. The climbers are impressive I must say! 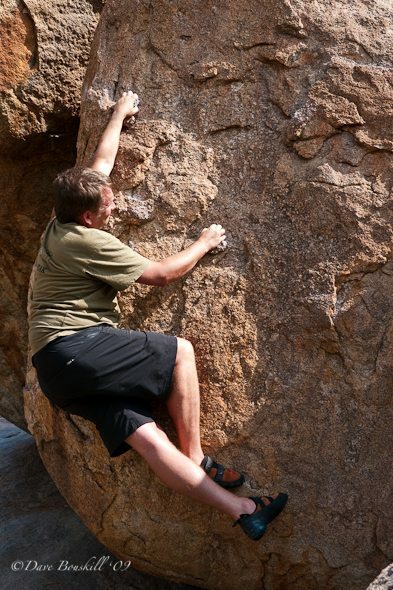 Bouldering takes a lot of strength, skill and finesse. It has become very popular over the years with competitions and in the gym, the great boulderer's always drawing a crowd. We may not be great at bouldering, but we can now brag that we have bouldered in India. You can rent from Charmella if you do not stay there for 70 rupees per day (includes shoes and mat) – sometimes gear not available and sometime the staff will have a little attitude if you aren't staying there. They will not offer up that Charmella rents gear. If you don't ask, they will send you away stating that they don't give gear to anyone not staying at Goan Corner. Rollo Guest House also rents gear. 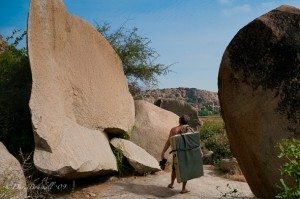 6 Responses to "Climbing in Hampi? Who Knew?" .-= Gourmantic´s last blog ..What to Do with a Truffle =-. .-= Trisha Miller´s last blog ..Suzy: Week 19 Goals-Tracking Your Site Searches =-. .-= Shannon OD´s last blog ..A Little Travel…Dreams and Plans for the New Year =-.